This recipe calls for three different fresh chiles - jalapenos, poblanos and Anaheim. Finding jalapenos and poblanos was no problem for me... but I didn't have much success with Anaheim at my local grocery store. Instead, I substituted with cubanelle peppers which are mild peppers in the chile pepper family. I normally don't cook with fresh chiles very often so shopping for these chiles was fun. It felt good going to the store, picking up some peppers and having an idea on what to do with them. 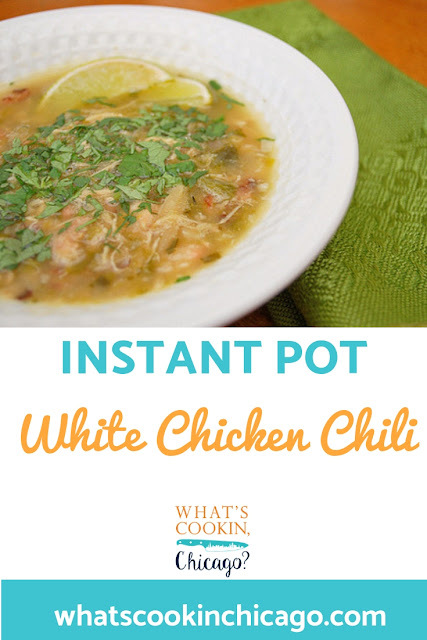 Before this recipe, I have to admit that I would have walked past the chile peppers since I really don't know too much about the difference, much less, the uses for them. The down side to working with chiles is that if you're not careful, you'll suffer from hot hands. What are hot hands? Oh, you know... that burning sensation you feel as if you marinated your hands in Tabasco sauce overnight. I guess I wasn't thinking and decided to handle the peppers without any gloves. I figured since I was rough chopping them for a recipe and then having my food processor pulse them down, I won't have any issues with hot hands. I couldn't have been more wrong. After preparing the recipe and letting it cook on the stovetop, that's when I noticed my hands starting to burn. Even with the little exposure to the chiles, they definitely did a number on me. Washing dishes and my hands over and over again didn't seem to help. Needless to say, I went to bed with hot hands and thankfully by morning, that burning sensation was gone. So if you make this recipe, take it from me - use gloves when handling those chile peppers! I will say that this recipe was worth the hot hands. The chili had a great flavor that packed in some heat. If you don't want it too spicy, feel free to cut back on the peppers from using 3 of each to 1 of each. You'll still get the flavor and color without all that heat. Do note that it will get hotter as it sits and the flavors really develop when you chill it overnight. I especially like serving chili, regardless of recipe, the next day when you really get a better flavor after all the ingredients meld. Plug in the IP with insert set in place. Press SAUTE and add oil to IP. Season chicken liberally with salt and pepper. Add chicken in small batches to the IP and cook without moving until golden brown, about 4 minutes. Using tongs, turn chicken and lightly brown on other side, about 2 minutes. Transfer chicken to plate. Repeat with remaining chicken until all have been browned. While chicken is browning, remove. and discard ribs and seeds from the chiles. Roughly chop the chiles and place half of the chopped chiles in a food processor. Process 10-12 pulses until you have a consistency of chunky salsa. Transfer mixture to medium bowl and repeat with the remaining chiles and combine with the first batch. Next process the onions in the food processor the same way and combine with the chiles. To the now empty IP, add minced chiles and onion mixture, garlic, cumin, coriander and 1/2 teaspoon salt. Cook, stirring occasionally, until vegetables turn translucent. To the now empty IP, add minced chiles and onion mixture, garlic, cumin, coriander and 1/2 teaspoon salt. Cook, stirring occasionally, until vegetables turn translucent. Transfer 1 cup cooked vegetable mixture to now empty food processor work bowl. Add 1 can cannellini beans and 1 cup broth and process until smooth, about 20 seconds. Add vegetable-bean mixture, chicken and the remaining 2 cups of broth and chicken to the IP. Press CHILI and adjust the time to 7 minutes on HIGH pressure. The display will reflect ON while the IP comes to pressure. Allow a few minutes for your IP to come to pressure. Once at pressure, the display will reflect 7 (the number of minutes you initially set) and will begin to countdown to 0 minutes. When the IP beeps after pressure cooking for 7 minutes, turn the setting on top of your IP to VENTING. Doing so allows the IP to quickly release any remaining pressure (also known as QPR or QR). I use a wooden spoon to carefully turn the setting to avoid close contact with the potential steam. You may also want to turn your IP away from cabinets to allow the released steam to escape freely. The pin at the top of your IP will drop when all pressure has been released and it's safe to open. Open up your IP when the pin has dropped (allow a few minutes for this to happen). Using tongs, remove chicken from IP and transfer chicken to large plate. Using tongs, remove chicken from IP and transfer chicken to large plate. Press SAUTE and stir in remaining beans and cook, uncovered until beans are heated through and chili has thickened slightly - about 5-7 minutes. When cool enough to handle, shred chicken into bite-size pieces. 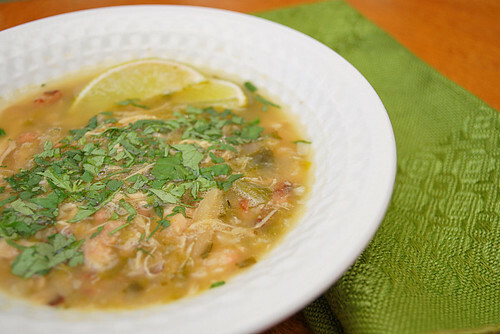 Stir shredded chicken, lime juice, cilantro, and scallions into chili and return to simmer. Adjust seasonings with salt and pepper and serve.Taste the chili and adjust the seasonings and spices to your tastes.